With such a surprisingly delightful denouement to the Champs League group stage, both in Basel and in Paris on Tues night and the 3rd round FA Cup draw throwing up an outing to Preston, the following missive has been pretty much outdated by more recent events. However having started half a dozen posts in recent weeks, only to fail to get around to finishing them, I thought I might as well post this one, if only for my own satisfaction. 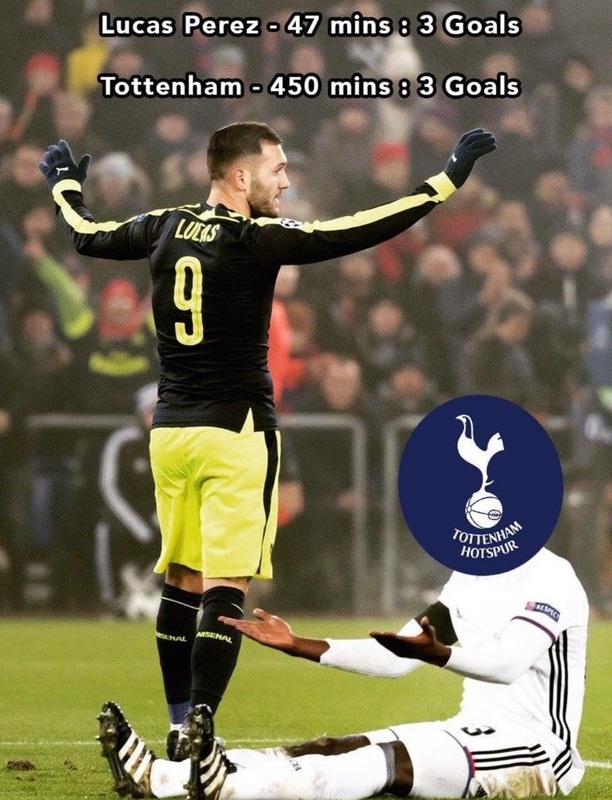 I have to admit that from the little we'd seen of Lucas Perez prior to Tuesday night's hat-trick, I wondered what on earth anyone had witnessed from him, to believe he was worth a weighty £17m investment. I was flabbergasted when Wenger played him on his own up front, in our disappointing League Cup defeat to Southampton. We'd seen us nothing to suggest that he'd be capable of fulfilling the lone striker role, in as much as sadly he doesn't appear to be blessed with either the talent, or the turn of pace to sufficiently ruffle the feathers of opposition defences. Nevertheless, while Lucas might not possess any outstanding natural assets, he is a grafter and is the sort of sufficiently busy player who doesn't warrant criticism, If a player is working their socks off, you can hardly knock him for the fact that he's not gifted with the game-changing abilities of the likes of Thierry Henry. Despite decrying Lucas as a waste of money, I distinctly recall commenting as we came away from our dismal League Cup exit that he was the sort of player who would probably do well, when playing with an in-form Arsenal side. The suggestion being that when the Gunners are on song, Lucas is busy enough and hungry enough to offer a positive contribution to our slick passing moves. I'm unsure whether Basel qualifies as a quality defence, but up until Tues night Lucas struck me as being much like the Spurs' acquisition Janssen, the sort of second rate striker with the attitude and determination that meant he might well have impressed against lesser opposition, but who lacks the top-shelf striking abilities necessary for him to be able to really cut the mustard on the big stage, against first rate opponents. However I'm always happy to admit when I'm wrong; never more so than when writing off an Arsenal player too quickly. Albeit that folks who know me can confirm that I rarely do anything in a rush, least of all with a "rush to judgement" and in truth, the jury was still out as far as Lucas was concerned. I'd yet to see anything from him to suggest Lucas was capable of adding something to our existing squad, other than as merely adequate cover to make up the numbers. Yet while one swallow definitely does not make a summer, on the evidence of Tuesday night's display alone, Lucas demonstrated that he might well be blessed with one single, vital attribute that the Gunners have been crying out for, for as long as I can remember (but then sadly I've the recall faculties of a goldfish nowadays!). Ever since Arsène had his fingers so badly burned, buying the long-term crock Franny Jeffers, any utterance of the phrase "fox in the box" has been a sacking offence at the club. So whisper it quietly, but Lucas produced a fairly decent impression of this particular creature in his performance against the Swiss champions. One of my mates commented that Walcott wouldn't have been in the six-yard box to get on the end of the passes for Lucas' two tap-ins. As has been all too evident with the likes of Theo, when it comes sniffing out goals, knowing when to run, or when to remain stationary, sadly this is an asset that simply cannot be taught. My old man used to call Jimmy Greaves a "goal hanger" and when playing as a hard working left-back as a kid, I can recall being seriously pissed off with those players who contributed little, other than to dawdle in the box, waiting to snaffle all the glory. The offside rule was intended to thwart these scene stealers and the development of the modern game seems to have largely put paid to goal poachers, to the point where it's become a lost art. I saw some stat about there being 32 passes in the build up to our 2nd goal on Tuesday night, a record in the Champs Lg this season. With our nine goal haul in the past couple of outings, the Gunners have given us a glimpse of the sort of sweet rhythm and tempo to suggest the promise of some proper "on song" footie to come. Hopefully this might offer Lucas more opportunities to demonstrate the art of being in the right place, at the right time, thereby confirming that the Spaniard truly has "a nose for goal"? As for Monday's Champions League draw, according to the laws of Sod and Murphy, it seems blatantly obvious to me that having finally managed to win our group for the first time in years (more by luck, or Ludogerets than good judgement! ), we are pretty much guaranteed a bum draw against the likes of Bayern, or Real Madrid. Although in the past it's usually been a "glass half full" effort to find some solace in the sort of duff result which is responsible for a daunting knockout stage draw as group runners up, I remain convinced that one has a better opportunity of dispensing a bloody nose to one of Europe's big boys, by meeting them earlier in the competition, before they become more motivated by the scent of a possible Champions League triumph. Moreover, while I'd be delighted by the prospect of inflicting a Valentine's day massacre in Portugal versus the likes of Porto or Benfica, personally I believe who we end up facing as a result of Monday's draw is far less significant than the psychological impact of finishing above a star-studded PSG and such a sweeping victory in Switzerland - although I was more than a little miffed that for the second successive game, we fluffed our opportunity to build some belief in our defensive resilience, with the lapse in concentration that dirtied our clean sheet. Come February, no one will be thinking about the fact that we could've been 0-2 down in the first half against Ludogerets, or how many goalscoring chances we gifted to Cavani. No, hopefully we'll be going into this game with the swagger of group winners, having not complacently lost a Champions League group game for the first time in over a decade. And the winning momentum that inspires the necessary belief is not just crucial in enabling us to play to our full potential. Hopefully it will also mean that whoever we end up meeting will no longer be going into this game with the perception of the Gunners as the sort of pushover we've all too often proved in recent seasons. As they say, familiarity breeds contempt and personally I like the fact that the Champions League shuts shop for the next three months, enabling us to focus fully on domestic matters and ensuring there's a mounting air of anticipation, until our European crusade is rejoined. I wonder how many attendance records Spurs will set for their Europa Cup outings at Wembley and I can hardly contain my excitement at the prospect of an encounter between the mighty Zorya Luhansk v Man Utd on the box tonight! Say what you will, no matter which side of the Arsène Wenger divide one is on, one thing is indisputable, it's not us watching Eastenders! PS. As reported in this link, one of my pals narrowly avoided disaster returning from Basel. As the beneficiaries of such good fortune, in what appears to be a terrifying close shave, now if I was a religious man, I might be inclined to believe that fate is smiling upon us Gooners? As an increasingly sentimental old bugger it was hard not to view the demise of West Ham's Boleyn ground through rose-tinted, nostalgic eyes, as yet another of the last few remaining traditional British stadia to bite the dust. 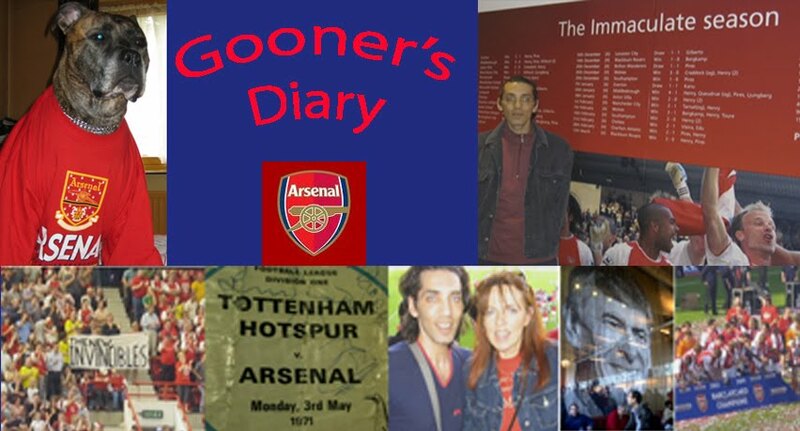 Nevertheless, with season after season of schlepping around the country to largely the same selection of Premiership venues, there's inevitably a certain frisson to the novelty value of a first visit to see the Gunners play somewhere new. The thirty quid cap on away match tickets (plus a generous further four quid discount from the club) has ensured that all the Arsenal's awaydays have become increasingly hard to come by, seriously hot tickets. However seats at our debut London Stadium derby were like gold dust and it felt as if every Gooner wanted to be there on Saturday. The last time I made this same journey to Stratford was when I was incredibly fortunate to find myself invited to Super Saturday at London 2012 and I've been curious ever since to discover how this wonderful athletics arena would be transformed into a decidedly less appropriate football stadium. Mind you, I must admit that in my frustratingly enfeebled state and in such arctic conditions, I might well have been tempted to give up my seat to one of the many desperate Gooners, to stop indoors and watch the game live on the box from under a duvet, if it wasn't for the fact of having yet to see a match at the Hammers new home. Albeit that any such decision would've been based on our infuriatingly tepid form of the past few weeks and I would've been absolutely gutted if I'd ended up on missing out on witnessing quite such a memorable Alexis' hat-trick live. However having lucked out on one of only eight disabled parking pitches for visiting supporters (seemingly preposterously limited availability, considering it's such a new gaff, set in such a huge expanse of what was formerly East London wasteground), I faced the daunting prospect of an unfamiliar journey on public transport, with it being the first time I've ventured onto the train in the past couple of years. Consequently, I spent most of the week fretting even more about getting to Saturday's match than about the Gunners ever more depleted options at right-back. Credit where due, my enquiries with the Hammers resulted in them being kind enough to post out a pass for a disabled shuttle bus service from Stratford station and actually the fifteen minute journey on the overground from Canonbury proved to be a doddle. Despite concerns about all the (undoubtedly exaggerated) tales of the aggro that's occurred at the London Stadium to date, I didn't feel uncomfortable combatting the cold with my Arsenal scarf, bobble hat and the surprisingly useful snood, which was included in our membership packs. Although I'd be a liar if I didn't admit to making sure that I didn't wear any colours that I wouldn't be able to stuff inside my coat, in the event that the atmosphere turned nasty and I felt the need to be more inconspicuous. However announcing my affiliations so publicly, as the solitary Gooner climbing onto a mini-bus crammed with home fans at Stratford station, pretty much guaranteed a good deal of banter. Having pleaded with all the other infirm old codgers to treat me gently, they were trying to persuade the driver to dump me at the Carpenters Arms boozer, presumably a pretty hostile Hammers watering hole. Hopefully the snaps might convey some slight impression that in spite of the cold, it was a wonderfully crisp and clear evening, standing on the concourse outside the ground, watching the sun drop and the moon rise, as a wonderfully picturesque backdrop to the East London skyline. Although the stewards were subjecting folk to a fairly comprehensive frisk, it would appear as if they remain on a steep learning curve in managing this arena. 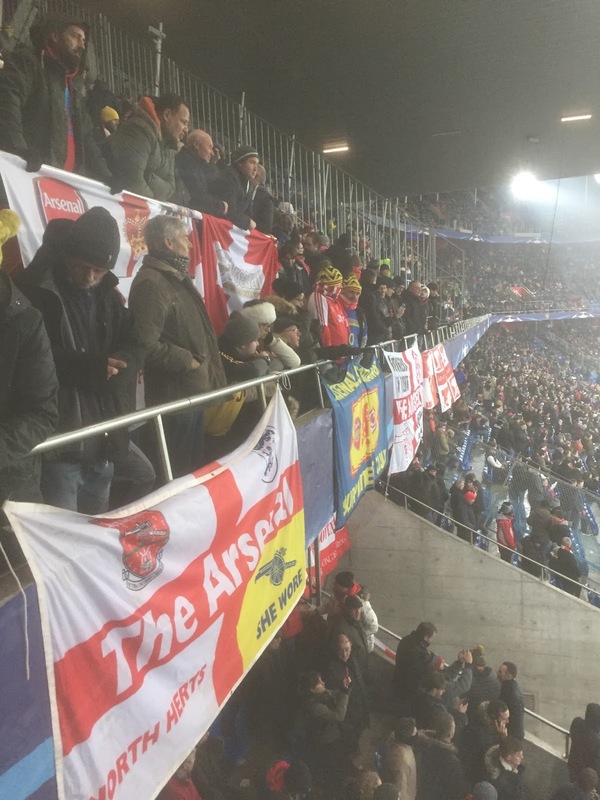 Much kudos to any of those Gooners who allegedly took advantage of the lack of focus on the turnstiles, to be able to achieve the rare feat nowadays of being able to bunk in, supposedly passing through the electronic facilities more than one at a time. I've seen all the complaints about the stadium and the fact that one is so far from the pitch, but I have to say that my initial impression as I arrived on the terrace in our corner of the ground was quite favourable. I was relieved to have remembered to bring my binoculars, but didn't feel nearly quite so detached from the proceedings as being stuck up in the gods at St James Park. Obviously the circumstances dictate that with the area of an eight-lane running track between the stands and the pitch, there was always going to be a world of difference between the sightlines of a purpose built football ground. I'll never forget the incredible atmosphere in this arena, when an 80,000 full house had the hairs on the back of my neck standing to attention, creating an atmosphere that carried Greg Rutherford and Jessica Innis to gold, before roaring Mo Farah to victory in the 10k with an utterly deafening racket for the entire 27mins. 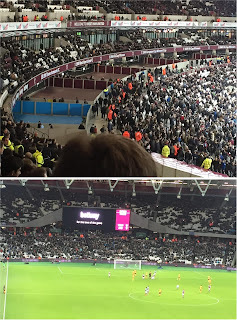 However West Ham's new home is now so unrecognizable from the Olympic venue that I sat there on Saturday struggling to work out where I'd been seated back in 2012. Little did I realise that we were in for an alternative encore to Super Saturday. I'm no fan of any stadium where the vast space between the terraces and the pitch discourages me from hollering at the players during the game, in the certain knowledge that any delusions of influencing proceedings by making myself heard on the pitch are utterly pointless. Yet with me sitting in the lower tier for home games, I don't mind having this distant perspective on the rare occasion because much like some of the mammoth grounds abroad, you benefit from the ability of being able to appreciate better where the spaces appear are on the field and enjoy a better understanding of how the two sides formations and tactics match up. Albeit perhaps the most obvious conclusion at West Ham on Saturday was that even if this particular Hammers team selection was seriously depleted, I'm inclined to believe that the Irons home form is likely to suffer for some time to come, certainly until the team grows more accustomed to surroundings that are in such stark contrast to the tight confines of their former home. Moreover I gleaned the impression that many of the more staunch Hammers' fans begrudge the fact that they've suddenly inherited twenty odd thousand newbies at every home game, resenting their apparent failure to appreciate the unwritten rules. The reason for such irritation was evident when Alexis scored his 2nd and our 3rd with ten minutes still left on the clock and the home fans began to file out en masse. Rarely has the "is there a fire drill" chant seemed more appropriate as vast areas of empty terracing rapidly appeared in the previously rammed stands all around us. 1000s of Billericay Dickies doing an early bunk? It was hilarious to see so many of these premature evacuators charging back into the stands only a couple of minutes later, when Carroll caught our defence napping, as the lanky Geordie reacted first to head home what merely proved to be a consolation goal. But they only lingered long enough for the Ox to put the kibosh on a repeat performance of Carroll's one man rescue mission, when Alex smashed in our 4th only two minutes after we'd annoyingly cocked up our clean sheet. On route to the ground, I'd joked with the Hammers' fans on the bus, bargaining for safe passage in return for restoring Carl Jenkinson to their porous defence and with the Corporal having enjoyed such competent looking performances whilst playing claret and blue, I'd wondered if this might be the ideal opportunity for Carl to try and redeem his severely battered reputation, playing before a crowd that has more faith in his ability than we do. Hector Bellerin has been such an asset this season that by comparison, Jenks has looked like a bumbling incompetent accident waiting to happen. Yet with his culpability in both of Southampton's goals, by leaving him out immediately after our cup exit, in favour of Gabriel, it felt as if Arsène has permanently written the Corporal off. Not only am I loathe to lose a rare squad member who'd be on supporting us on the terraces with his family, if he wasn't a professional player, at least Carl is a full-back by trade, who is accustomed to haring down the flank and whipping in a decent cross. But if Wenger doesn't have sufficient trust in Jenkinson, then personally I'd prefer to see the Ox, or the likes of Maitland-Niles afforded an opportunity in the right-back spot. Although Gabby might not have been guilty of any major defensive gaffes thus far, it seems to me that by using a player who gets a nosebleed whenever he crosses the halfway line, we are only inviting pressure from the opposition. In the opposition manager's shoes, I'd certainly be instructing my side to target our right flank, knowing there's so little jeopardy involved in their left sided players rampaging forward, with Gabriel so unaccustomed to exploiting the resulting space at the opposite end of the pitch. At the time, when Alexis scored our second and the first of his three goals, with his first touch having taken him so wide, presenting him with such a tight angle to shoot at, it seemed that such an accomplished finish was, as they say, worth the price of admission alone. It wasn't until drooling over a replay of his feats on the box later that evening that I realised Alexis third goal was the pick of the bunch, upon discovering how he'd sat Randolph down with quite such a sublime, piss-take of a dummy, in the astonishingly casual climax to his hat-trick. Yet truth be told, we should've put this game to bed in the first half and not only did we fail to press home our patently obvious advantage after the break, we were guilty of going to sleep, playing in such a complacent and sloppy fashion that I was convinced we were far more likely of suffering a late sucker punch. It wasn't until West Ham had given up the ghost following our second goal on 72 mins that we began to relax in our corner of the ground, as the Gunners turned on the style. Up until this point, I'd spent most of the match tearing my hair out in frustration at our blatant failure to get any bodies in the opposition box, with Alexis as usual, just about the only player in red and white showing the willingness to try and make something happen, whereas following the watershed of our second goal, suddenly everyone wanted in on the act. Meanwhile, even accounting for the infuriating lack of concentration that gifted Carroll with the opportunity to spoil Cech's clean sheet, it feels decidedly churlish of me to be whinging after a rare five goal treat (so long as Spurs superior goal difference on Saturday ultimately proves irrelevant!). What matters most will be the abiding sense that such a comprehensive margin of victory might at long last lend the team with the perception that they are finally playing themselves into some much needed form at such a crucial stage in the campaign. 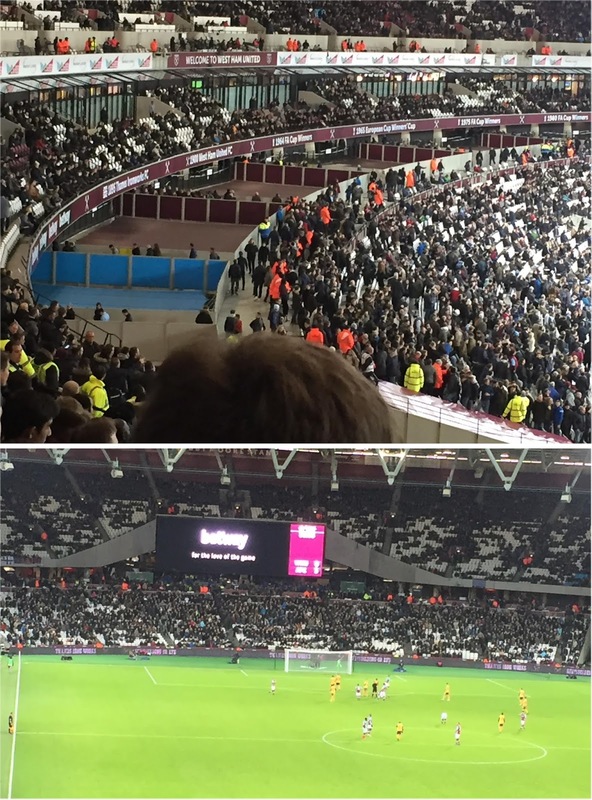 Assuming the Hammers struggles to come to terms with their cavernous new arena doesn't end up costing them a disastrous relegation trap door exit into potential oblivion, the memory of Saturday's scoreline will certainly ensure that we'll be looking forward to returning to the London Stadium in future. There was little more damming evidence of Bilic's problems than the long spell of "olés" ringing out from our end of the ground, during an extended period of possession of piss-taking proportions in the dying stages. In any previous London derby the increasing sense of outrage emanating from the home fans would've inevitably resulted in the sort of "take one for the team" type clattering that might've silenced our taunts and which I was become increasingly fearful of the longer our possession and the chant persisted. My own "olés" might have been as loud as anyone else but at the same time, I was terrified that the ignominy felt by the homegrown likes of Noble might eventually force him into losing the plot, perhaps causing serious damage to the positively pivotal likes of Mesut or Alexis. Yet the fact that the home team failed to even intercede with such a blatant foul speaks volumes about the absence of fight in the claret and blue dog and this might not bode well for the sort of gutsy determination that might be required to drag themselves clear of the relegation mire. Having begun this missive before Lucas banged in another hat-trick in Basel, seemingly with two such fulsome away victories on the spin, it behoves the team to produce a similarly sweeping triumph before a full-house of Gooners against Stoke on Saturday, in the hope of getting our home crowd all pulling in the same direction. There's a role call of hat-trick heroes, with their individual feats recorded inside our ground near to where we sit, between the entrances to blocks 18 and 19 on the opposite wall and I was only looking at it a couple of weeks back, contemplating what the club will do when they run out of space. I reckon there might only be room for one or two more, once they've added the hat-tricks of Alexis and Lucas and hopefully, should the Gunners continue with this prolific strike rate, it might be like buying a new car because the ashtrays are full but hopefully we'll be needing another new home before this season is out! All Arsène Wants For Xmas.....?